RA reports 6 ppt when it cannot see the probe. Mine is disconnected right now during my re-wire and the portal says 6 ppt. Fine, but my point is that I wasn't doing a re-wire or anything. There was no reason for the probe to not be seen. The minimum value of the salinity module can measure is 6ppt. That's why you get 6 showing up. Anything lower than that will require a different probe, but we are really not interested in less than 6 ppt anyway. Right now I have the code commented out and I'm going to keep an eye on things for a bit and see if and when it happens. At first I thought it maybe happening when my de-nitrification unit sumps water back in the sump at 1, 7, 1 and 7, but I don't think so because it happened at 1 and 5:45 and did not happen again at 1pm. There was a slight dip at 1pm of about .2 ppt, but that's nothing. This issue of dropping to 6ppt or not being recognized has stopped, but now I'm having spikes of 36 ppt a couple of times a day. It usually reads 34.5-34.7 ppt, but I've noticed jumps up to 36 ppt several times during the day and these are very brief time. This is from 1:30 am to 7:45 am today. rimai wrote: The minimum value of the salinity module can measure is 6ppt. That's why you get 6 showing up. 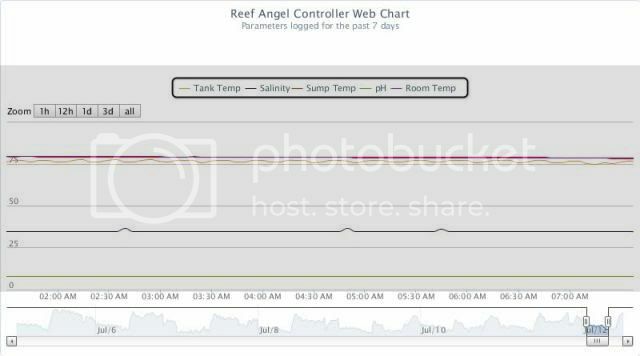 I had asked earlier about doing EC monitoring for my freshwater tank. You had replied that the Salinity was simply an EC monitor. I looked at the code and the formulas didn't appear too cumbersome to "undo" any Salinity calcs so I got one. It is all hooked up and shows up on the portal. But, the only way i get anything but 6ppt is to dip it into my fertilizer bottle and there I get 52. When i do a straight Salinity.read - which is where it looks like the raw reading from the expansion occurs i get a 60 back on the serial.print stmt in serial monitor - which is based on other similiar readings is to be taken as 6.0 ppt. Ok, so what I am wanting from it is just the raw microSiemens reading from the probe. Do either of the two jumpers on the board alter the output in any way? Where could i get a different probe if that is what is needed. just google for the equation to convert ppt to microSiemens. Thanks for being patient with me as I muddle through this! They are test points where you can connect an oscilloscope to troubleshoot the circuit. Is the expansion hard coded to not return below 6ppt? The probe is a K=1 rated and goes down to 5uS. (7 ppm). That is the middle ranges probe.